Fat Yankee Jerky is a new brand that launched in May 2016 by Keith Rainville and his wife Brenda. Both hailing from Rhode Island, they moved to Florida about 12 years ago. Keith wanted to start a new business, and decided to get into the meat snack industry after friends told him how awesome his homemade jerky is. 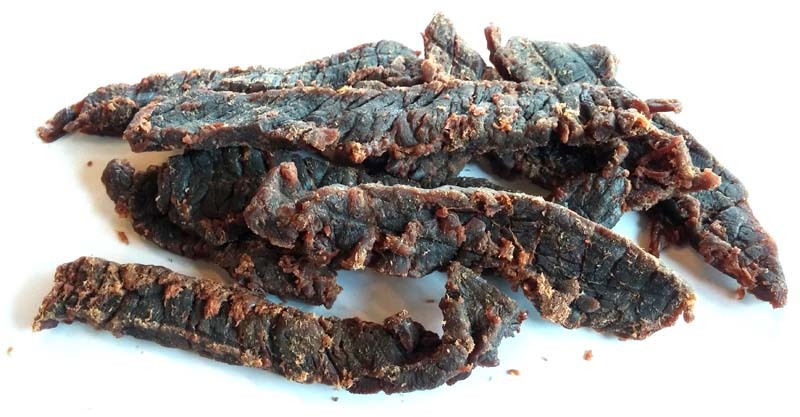 Fat Yankee Jerky uses hand trimmed, top round black angus beef, sliced thick. It's marinated in 6 pound batches for 48 hours, and hand tossed after 24. This Cherry Smoke is described by the company as, "Delicious Taste of of rich cherry flavor with nice smokey finish! This is awesome on every level." Beef, soy sauce, soy beans, cherries, water, brown sugar, high fructose corn syrup, spices, citric acid, potassium sorbate, salt, smoke, vinegar, wheat & sodium benzoate. The first flavors that I pick up are a sweetness and the smoke. A light bit of salt comes in. The chewing brings on a touch of fruitiness and a bit of soy sauce, along with some natural meat flavors. For being named, "Cherry Smoke", and described as, "rich cherry flavor with nice smokey finish", I'd say this holds up. I do taste a fruity character, and it does have that unique cherry character, but not tart by any means. But this does have a noticeable smokey quality and aroma. Otherwise, the primary taste profile is sweet and fruity with a light tanginess. The smoke is noticeable with a light salt and soy sauce in the background, and the natural meat flavors in the latter part of chewing. It's totally mild in spice. The meat consistency looks excellent. Thick cut strips that feel semi-moist, and slightly drier in the chewing. It chews easily, with a meaty character, and with the texture of a well-done cooked steak. Very little fat is visible, and nothing stringy or unchewable was felt. 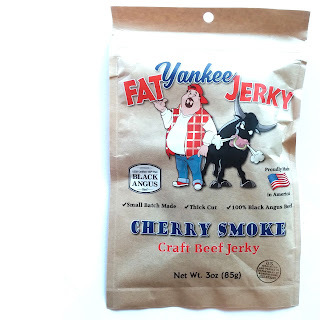 This Cherry Smoke beef jerky from Fat Yankee delivers on its advertised flavor over a meaty, steak-like chewing. The initial fruity tanginess with the sweet and smoke livens up the senses and grabs my attention for a short while. But after a few pieces, it wasn't enough to keep my attention. The natural meat flavor didn't have that pan-fried steak flavor I found in the company's Garlic Beef Jerky that I reviewed last week. This tended to taste grilled with little to no seasoning. 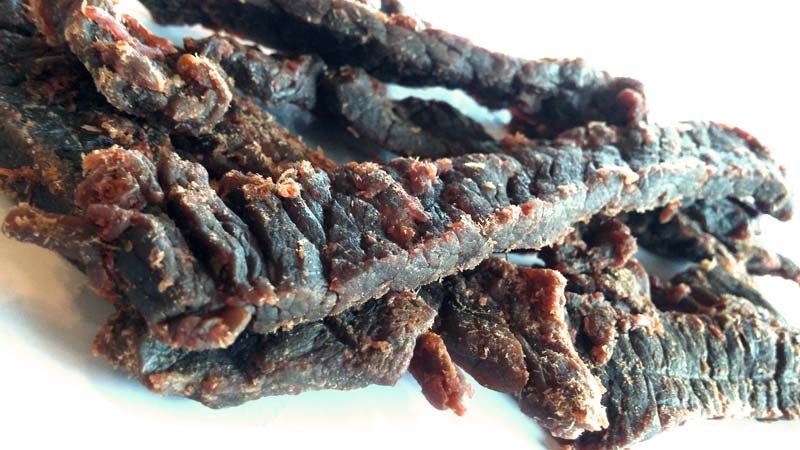 It's actually a light tasting jerky that relies on a tangy fruit to grab attention, but needs something else to keep to keep that "wow factor" going. It's a great jerky to nibble on with pilsners and light ales.